i stopped myself from spending over $100 (for the free shipping) at american eagle yesterday… this morning, i found an electric snow thrower for less than that. i’ll sit on the decision til the afternoon. only two more painful mornings leaving my sweetie and dags behind before i don’t have to extend beyond a 1 mile radius of my home unless i want to. on friday, we packed the dogs up to stay at my mum’s while matt and i took off up north for the night. his brother had planned a little shindig and it seemed like a good time to hand out holiday gifts. the nephews loved their light-up moon and insisted on taking it to grandma and grandpa’s (where they stayed) for the night. the next day, we visited with matt’s parents for a bit and then went to see his grandma (who’s in a nursing home now). she was a sweetie. she tried to give us a bag of sugar packets that she had collected from the lunch room… it makes me wonder what kind of quirky things we’ll do when we’re 90 that are reminiscent of the times in which we grew up. on sunday, i slept way in again… took the dogs on a long walk, headed to woodman’s, made some lunch, and worked on some knitting while watching the office. that show cracks me up. i keep writing really boring blog posts and then deleting them. we’re planning on painting the bedroom during the week that i’m off work. i’m not sure exactly when, but i’m a little nervous about how long it’ll take and what it’ll look like when it’s done. i’ve never had a bad painting experience, but i’m always unreasonably nervous about it. i finished a pair of bittens for liz in about two days, but that’s all the knitting i’ve done. i really want to finish that sweater. nora’s nail is doing a little better; we took her to the vet a week ago and she was such a good sport. she’s not been favoring it or licking (very much) and should be fine. work’s been really slow and mostly boring. there’s nothing quite as awesome as biting into an apple that is rotten. i’ve been having some pretty intense, bizarre dreams lately involving people from my recent past and it’s been bugging me; i wake up confused and frustrated. i need to keep a pad next to the bed in order to write down participants and events… maybe there’s a pattern. i was enjoying some knitting on sunday… sitting on the couch watching the office on my ipad with a dog on either side of me. i heard a plow-like thing outside and got up to look out the window. upon my return to the couch, i realized that i had no idea where my needle went. i looked *all* over. 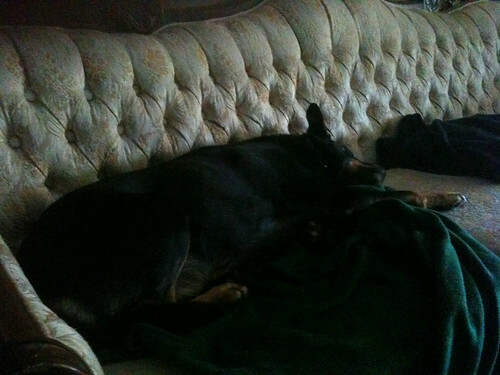 i tore up the blankets, made the dogs leave the room, i even questioned whether or not i had left it in the kitchen. i couldn’t find it. still haven’t. they’ve been going by too quickly lately. on friday, when i got home, i had a strange hankerin’ to walk around hobby lobby. so i got a resistant matt off the couch and we headed over to south towne (why are they all spelled like that?). i didn’t find anything worth buying, though there was a skein of yarn that i eyeballed for more than a minute. we proceeded to la bamba for a couple of burritos not quite as big as our heads. saturday didn’t roll out as intended, but we managed to get to woodman’s before the rain started. it turned out a sloppy evening; we grabbed some neighbor friends and walked to mickey’s, luckily the sleet turned to snow almost in front of our eyes. on sunday, i couldn’t be arsed to get out of bed at a reasonable time. my brain seems to work overtime on sunday mornings… i should record my thoughts when they’re racing. they’d probably seem silly in retrospect. the dogs were digging the snow until this morning… it’s much too cold for their tootsies. since i’ve had a cigarette. i could smell a cigarette from the car in front of me at a stop light this morning and it made me scrunch up my nose. i really can’t believe it’s been almost a year.